No company had a stranger run of horror movies than drive-in supplier Crown International, and one of its rattiest features, Blood of Dracula's Castle, has been trotted out in various editions over the years but has a few new bells and whistles here to justifyanother visit on DVD with another of the company's more high-profle films, The Hearse (click for full review of that one). This Al Adamson cheapie features a memorable title and the can't-miss proposition of horror vet John Carradine in a vampire film, but as usual Adamson can't do it the way you'd expect. Instead Carradine plays George, the butler for the stuck-up Count Dracula (Horrors of Spider Island's D'Arcy) and his wife (Hand of Death's Raymond), who like to keep random kidnapped women chained up in their California castle dungeon for their blood supply. A jailbird named Johnny (Dix) clobbers the prison guard who helped him escape (a cameo by production manager John "Bud" Cardos, future director of Kingdom of the Spiders) and eventually crashes the castle along with unfortunate photographer Glen (O'Shane) and his girlfriend Liz (The Mad Room's Bishop), who think they've inherited the castle but have a big surprise waiting for them. Then there's the Count's drooling, misshapen manservant Mango (Blue Sunshine's Young), who does the aforementioned kidnapping and bloodletting when he isn't stumbling around scaring people in the dark. If you've seen any Al Adamson films, you already know that this one isn't "good" in anything resembling the traditional sense of the word. Al can't seem to pace a story to save his life, so he resorts to padding. Lots and lots and lots and lots of padding. The opening with the first victim, a hapless female driver (Volonte), spends a silly amount of time sharing her radio-listening and driving habits with the audience, and there's an early trip to a marine animal park for good measure, too. 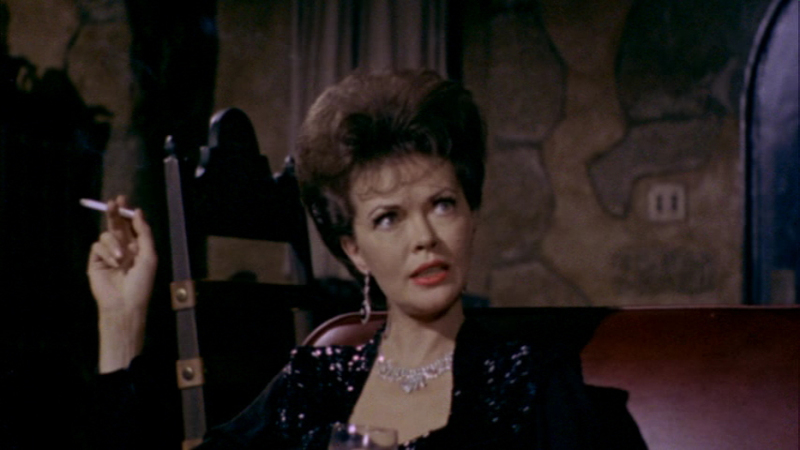 That said, there's something hypnotically weird about the whole thing, especially with Mr. and Mrs. Drac sitting around talking like a couple of elitist country club members. Not surprisingly, this one proved exploitable enough to live on for many years after its first release (when it was usually paired up with another Crown title, Nightmare in Wax, also with Cardos). In its theatrical form the film ran 84 minutes, but when it needed to be lengthened for TV, an additional five minutes were added expanding upon Dix's odd relationship with the full moon. 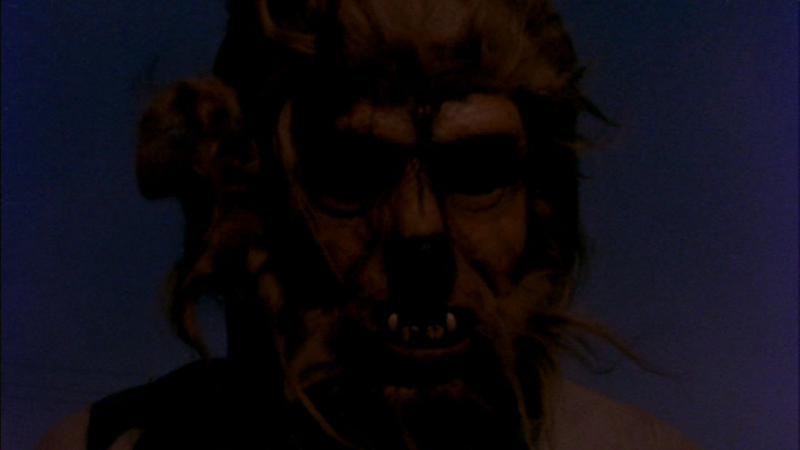 In this expanded cut, Dix actually turns into a werewolf and rampages through the sagebrush at random intervals through the first half of the film, all accompanied by some pretty wild psychedelic rock guitar music. The shorter theatrical version made its DVD debut as part of Rhino's Horrible Horrors Vol. 2 set (paired up on the same disc side with Nightmare in Wax, appropriately enough), in a mediocre transfer with several intervals of severe print damage. BCI announced a reissue of the two films as a remastered double feature but closed shop before the DVD could be released, but they eventually made it out of the gate from Mill Creek in the budget-priced Gorehouse Greats Collection, which smushes 12 movies into three discs with the usual substandard compression. The Scorpion release not only features a fresh transfer (finally framed at 1.78:1 without those huge open expanses of dead space at the top) but the expanded cut as well, with those daffy werewolf scenes finally back in for the first time on DVD. They're actually the most lively and entertaining part of the movie, so it's nice to finally have them back even if they just barely connect with the rest of the movie. Image quality is also cleaner and better, relatively speaking; this will never be a particular stunner of a film in any kind of aesthetic sense as even the film stock seems to change depending on the scene, but as far as Adamson films on DVD go this is definitely in the upper tier, presentation-wise. Rather than the traditional hosting bits, Waters returns here for "Kat's Eyes," a 28-minute interview with Cardos in which the two sit down to chat about his start in show business, his arbitrary duties on a few of Adamson's films, and his various memories of working in different capacities on cult films well through the 1980s. It's a fun piece that goes well with his commentary tracks elsewhere and a welcome addition to one of Adamson's strangest but most widely-seen monster outings as few have seen it before. Reviewed on July 15, 2012.